It was a perfect day for planting. Today the White Sonora Wheat went into the ground out at Sossaman Farms. We helped Steve Sossaman and Al load up the drill (that's the green thing behind the tractor) with seed but mostly pretended to be farmers. The seed will hang out in the ground through winter and start to come up in the spring. By May we should have 10 acres of amber waves! Posted on December 27, 2011 by Emma and filed under Blog and tagged 2011. Posted on November 22, 2011 by Emma and filed under Blog and tagged 2011. Fresh from the oven! My dad just pulled out this beautiful loaf. 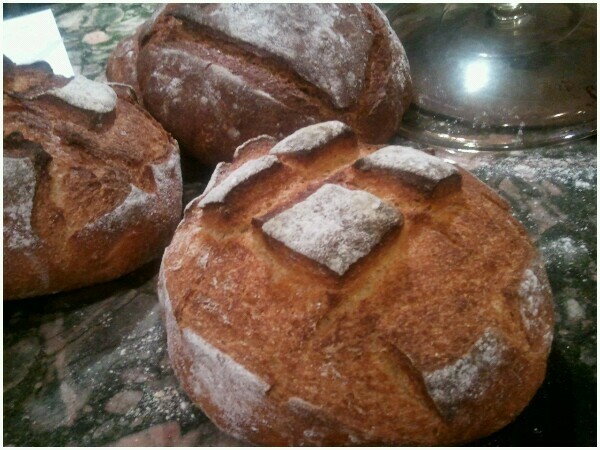 It's made from a mix of our barley flour and cornmeal. Posted on November 20, 2011 by Emma and filed under Blog and tagged 2011. I wanted to show you the dark coffee color of the chapolote corn. 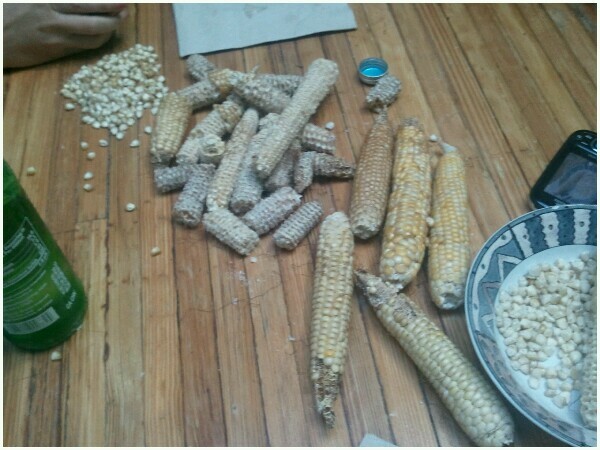 The cobs that we milled last week were a lighter variation. Hopefully the next crop will come in these beautiful dark browns. This cob is from Native Seeds/Search. The great folks down there have been teaching us alot about the rich agricultural history of the southwest. If you haven't yet, go check out their selection of indigenous and heritage seeds on their website! Posted on November 17, 2011 by Emma and filed under Blog and tagged 2011. Posted on November 15, 2011 by Emma and filed under Blog and tagged 2011. Flour for sale at Singh Farms! What are you doing this Saturday? Now that the heat has broken and it's starting to feel like Fall, get out to Singh Farms at the 101 and Thomas. They have a farmers market from 8am-1pm. It's an secret oasis in the middle of the city--you've probably driven past it on the 101 and never even realized it. They have an outdoor kitchen and you can sample the best of the garden for $5 a plate. It's a great way to spend a Saturday morning. And while you are out there pick up some of our Polenta, Cornmeal or Whole Grain Flours! Posted on October 11, 2011 by Emma and filed under Blog and tagged 2011. Not with a shirt and pants. The millstone needs to be sharpened every few years. Over time the grooves wear down and it doesn't grind as evenly and efficiently. It's an ancient art and very few people sill know how its done. Posted on September 26, 2011 by Emma and filed under Blog and tagged 2011. Since moving the mill into the back of Pane Bianco we've been busy getting the mill prepped and tuned before we could turn it on. First we had to reassemble it, have it specially wired (and then re-wired because somebody but the motor back on wrong:me!) and then we had to level out the milling stones which had shifted in transit. But finally, this morning, we flipped the switch and threw in the first bag of grain. A Organic Turkey Red from Kansas. We were so pleased with our first batch of flour that Marco, Pane's baker extrordinare, took it right from the hopper and put it in his mixer. It will have to proof over night, but tomorrow we are going to bake some loafs and we are crossing our fingers for something inspirational. Stay tuned! Posted on August 30, 2011 by Emma and filed under Blog and tagged 2011. Posted on August 13, 2011 by Emma and filed under Blog and tagged 2011. The wheat was harvested on Saturday. Milled on Monday. And Marco baked with it on Tuesday. 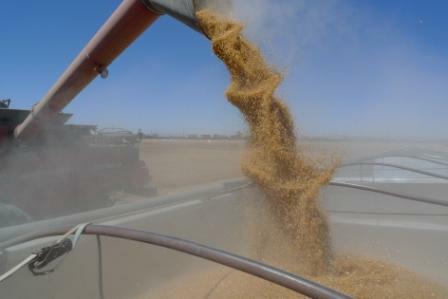 Look at the golden color of the durum wheat. That's what gives pasta its yellow color. Posted on June 10, 2011 by Emma and filed under Blog and tagged 2011. Josh Perrault and Wyatt Smith at Santa Rosa farms have signed up to be our first local farmers. 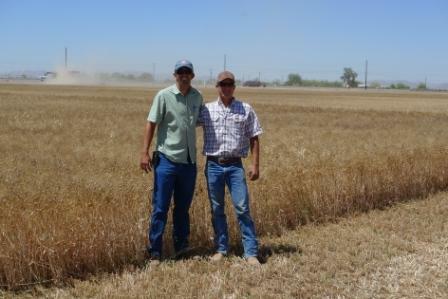 It turns out that Maricopa is one of the best places to grow durum wheat. Most of their crop will be be shipped to Italy and be turned into pasta. But we were lucky enough to get a few hundred pounds to mill oursleves. We are looking forward to working with the great people out at Santa Rosa! 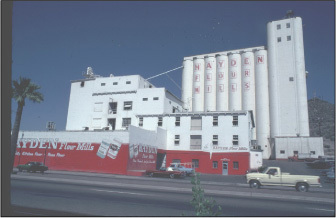 Posted on June 4, 2011 by Emma and filed under Blog and tagged 2011.
hayden flour mills featured in edible phoenix magazine! Edible Phoenix is a quarterly magazine that promotes the abundance of local foods inthe Phoenix area with articles about the family farmers, food artisans, chefs, and other food-related businesses that bring us the highest quality, fresh, seasonal foods. 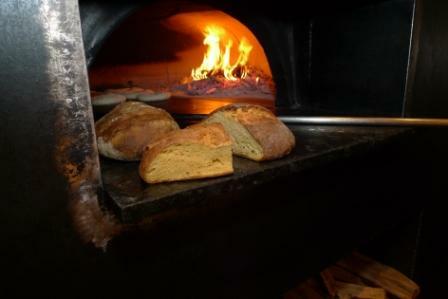 Read about Hayden Flour Mills’ Local Grain Project in the Winter 2010 issue of Edible Phoenix. 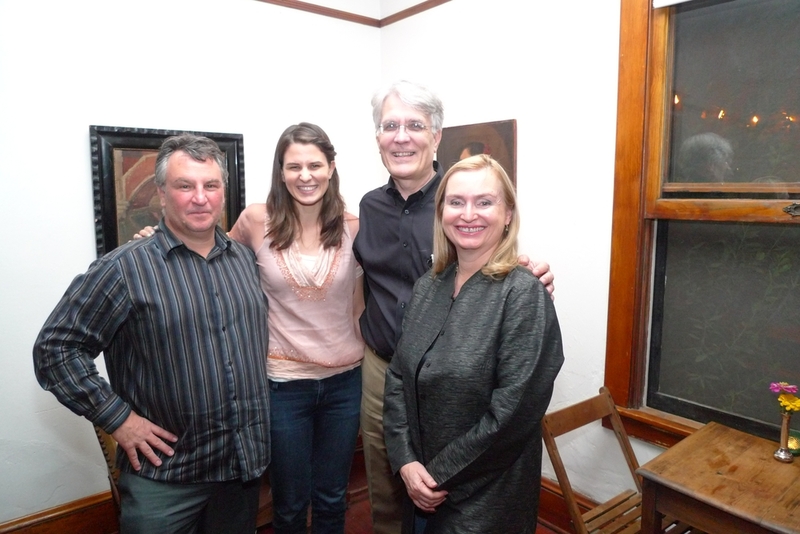 Posted on April 1, 2011 by Emma and filed under Blog and tagged 2011.